Quinton de Kock (born 17 December 1992) is a South African professional cricketer who plays for the Titans at domestic level and the South African national team. An opening batsman and wicket-keeper, de Kock saw his good form in the One-Day and Twenty20 formats lead to his selection for South Africa during the 2012–13 season, and he has since played regularly for the team at both One Day International (ODI) and Twenty20 International (T20I) level. In February 2014, he also made his Test debut for South Africa, playing solely as a batsman. By his 20th ODI match, he had already scored five centuries. He became the fourth player to score three successive one-day centuries and the second player to score four ODI centuries before his 21st birthday. Quinton de Kock is widely regarded as currently the best wicket keeper batsman in the world and has received comparisons to Adam Gilchrist. In his 74th ODI, against Sri Lanka on 10 February 2017, he became the fastest player to complete 12 ODI hundreds, bettering Hashim Amla, who had achieved the landmark in 81 innings. Before joining the Titans in 2015, de Kock played domestic cricket for Gauteng and the Highveld Lions. He has also played in the Indian Premier League (IPL) for Sunrisers Hyderabad and Delhi Daredevils.He is one of the most explosive young batsmen in the world with a knack for always scoring quick runs. In Tests, he saw better success batting down at no.7 to save the team, much like Adam Gilchrist. In May 2017, he was named South African Cricketer of the Year, Test Cricketer of the Year and ODI Cricketer of the Year at Cricket South Africa's annual awards. De Kock attended King Edward VII School in Johannesburg. He was spotted as a schoolboy talent and used to play for the affiliate club Old Eds. In the 2012 ICC Under-19 Cricket World Cup, he scored 95 off 131 balls in South Africa's first match against Bangladesh, which the team won by 133 runs. In the second match against Namibia, he scored 126 off 106 balls, with South Africa winning again, by 209 runs. In the quarter-final match against England, de Kock scored only 7 runs, but performed well as wicket-keeper, recording five dismissals (two stumpings and three catches). Overall, de Kock scored 284 runs throughout the tournament, ranking fourth for the tournament. From Johannesburg, he debuted for Gauteng's senior team during the 2009–10 season, aged 16, and subsequently represented the national under-19 team at the 2012 Under-19 World Cup. De Kock was bought for $20,000 by IPL franchise Sunrisers Hyderabad in the IPL players' auction on 3 February 2013 to play for the 2013 IPL Season. But he failed to impress in IPL-6 when he got chances in the Sunrisers Hyderabad squad. In the Indian Premier League (IPL), de Kock spent the 2013 tournament with Sunrisers Hyderabad, and signed to the Delhi Daredevils for the 2014 tournament. On 12 February 2014, De Kock was sold to Delhi Daredevils for Rs 3.5 Crore (approximately $560,000 according to the then exchange rate) in the IPL players' auction. He eventually became the highest bid foreign wicket-keeper in the auction. He has been a part of the Delhi Daredevils team since 2014. 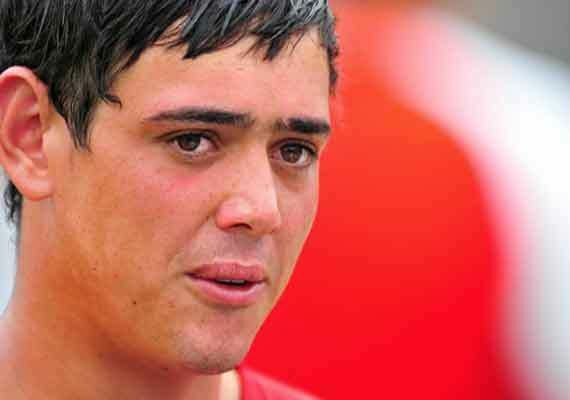 De Kock came to the spotlight after scoring 51 not out off 33 balls in their first match for South African Highveld Lions against Mumbai Indians in Champions League Twenty20, 2012 in Johannesburg. While chasing 158, after an early breakdown, he along with the experienced Neil McKenzie took the team home. Although he failed to keep this consistency in the remaining matches, he came to the spotlight after this tournament. In 2013 CLT20 which was hosted in India, de Kock scored 109 not out off 63 balls against Otago Volts in Jaipur, Rajasthan. De Kock represented South Africa for the first time, at T20 level, on 21 December 2012 against New Zealand. While South Africa crushed New Zealand and got them all out for only 86, the hosts chased it down easily with 8 wickets still remaining. De Kock made an impression on his first appearance by scoring an unbeaten 28 off 23 while chasing. He also kept wicket and gloved two catches. De Kock made his debut for the South African ODI side on 19 January 2013, against New Zealand at Boland Park Stadium, Paarl, South Africa. It was reported that he was training and grooming under veteran retired South African wicket-keeper batsman Mark Boucher ahead of the ODI series against New Zealand. He was promoted to the opening batting spot from his second match onwards with Graeme Smith in his debut series. In November 2013, he was selected in the first XI of South Africa against Pakistan in the United Arab Emirates, in place of Colin Ingram. De Kock scored a match winning 112 off 135 balls on a tough batting track in Abu Dhabi in the fourth ODI to reach his maiden ODI century. South Africa won the ODI series 4–1. They also played two T20 games against Pakistan. De Kock scored 48 not out in the first match while chasing and took them home. They won that T20 series too by 2–0. On 5 December 2013, De Kock scored 135 against India at his home ground in Johannesburg. His innings guided the team to a 141-run victory over India and he was awarded his first ever 'Man of the Match' award in One Day International cricket. He followed his performance with another successive ODI ton in the next match against the same team in Durban. He scored 106 runs making a record-breaking opening stand of 194 in Durban with fellow teammate Hashim Amla who also scored a century in the same match. This performance awarded him another 'Man of the Match' award while they already won the series beating India by 134 runs. He again broke a century knock of 101 in the 3rd ODI which was later abandoned due to rain, but he became only the fifth person to achieve this feat of three consecutive centuries in One Day Internationals, after Zaheer Abbas, Saeed Anwar, Herschelle Gibbs and AB de Villiers. He also became the highest run-getter ever in a three-match bilateral ODI series, breaking the previous record of Martin Guptill. Meanwhile, he was awarded the 'Man of the Series'. De Kock scored his 5th ODI century knock of 128 against Sri Lanka to record their first ever ODI series win in Sri Lanka. He also scored his maiden test fifty in the series. In the 3-match tour to Zimbabwe in August, 2014, De Kock eventually became the joint quickest batsman to reach 1000 runs in ODI cricket sharing the record with Viv Richards, Jonathan Trott and Kevin Pietersen. He reached the milestone in 21 innings. He was also awarded the 'Player of the Series' in that tournament where South Africa beat Zimbabwe 3–0. In February 2014, de Kock made his Test debut for South Africa, scoring seven runs in the first innings and 34 runs in the second innings against Australia at St George's Oval in Port Elizabeth. In January 2016, when South Africa was losing the home Test series against England, De Kock was recalled to the Test side for the second Test, taking the keeper's gloves from AB de Villiers, but failed to deliver. He was replaced by Dane Vilas at the 11th hour before the third Test, after a freak injury he picked up at home the afternoon before. He was again selected for the fourth and the final Test and scored his debut Test century with a score of 129 not out in the first innings coming to bat at number seven. In the tour, De Kock reached a milestone as the fastest to reach 10 ODI centuries. He completed his 10th century in his 55th match. In March 2014, South Africa played a 3-match Twenty20 series against Australia. De Kock was named the 'Player of the Series' in the tournament although South Africa lost the series by 0–2. Quinton de Kock married his girlfriend of four years, Sasha Hurly, in September 2016. La malavita attacca la polizia risponde!